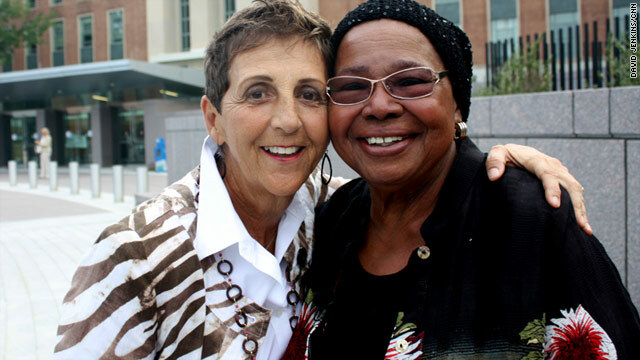 Breast cancer patients Pat Howard (left) and Heraleen Broome. Both are attending FDA hearings on the drug Avastin. (CNN) -- Monday morning, Patricia Howard, 66, was at Memorial Sloan-Kettering Cancer Center in New York, undergoing scans that led doctors to declare her cancer-free -- five years after her advanced breast cancer was diagnosed. A day later, she was in Silver Spring, Maryland, facing a panel of six experts at an unusual hearing held by the Food and Drug Administration: two days of discussion and a vote on the fate of Avastin, the drug that Howard says saved her life. "I'm not just a piece of anecdotal evidence. I'm a wife, a mother, sister, aunt, grammy, and a friend," she told them. "I never thought that in the United States, I would have to beg for a drug that is keeping me and many others alive," Howard continued, an edge to her clear, crisp voice. "Please approve Avastin treatment for my disease." "I want to explain to them the quality of life that I have. ... I play golf, I shop. It's amazing," she'd told a reporter just before going inside. "My scans were completely clean, which means there is no evidence of cancer. I attribute this to taking the drug Avastin." For all the emotion, there's a whiff of Bill Murray's "Groundhog Day" in the proceedings. In July 2010, a similar advisory panel voted 12-1 to withdraw the specific approval of Avastin as a therapy to treat advanced, or metastatic, breast cancer -- cancer that has spread from its original site. The reason: Four clinical studies showed that the drug did not, on average, make patients live longer. The panel also cited dangerous side effects, including increased risks of internal bleeding and high blood pressure. In December, the FDA's Center for Drug Evaluation and Research (CDER) took the panel's advice and proposed that Avastin's approval to treat advanced breast cancer be taken away. In most cases, the story would end there. This time, before FDA Commissioner Margaret Hamburg could make the recommendation final, Avastin's maker, Genentech, filed an appeal, exercising its right under the law that created the "accelerated approval" process under which the drug was approved. The panel's vote last July has already steered many doctors away from prescribing Avastin, according to Charlotte Arnold, a Genentech spokeswoman. She said the number of patients receiving the drug dropped from about 60 percent of new cases to only 20-25 percent. Metastatic breast cancer is diagnosed in approximately 29,000 women in the U.S. every year. With an illness where a few extra months of life amounts to a "good" outcome, stories like Howard's strike a chord. Tuesday morning, she wasn't alone, as more than two dozen women, friends and supporters lined up to tell their tales, often to a smattering of applause. There was tension as well, as a handful of speakers said they supported the FDA's action. "It surely is not a cure, and it does not extend life," Christine Brunswick of the National Breast Cancer Coalition told the panel. "The drug does raise false expectations and does detract from focusing on other research that may produce effective and lifesaving drugs." It surely is not a cure, and it does not extend life. As Brunswick left to sit down, the next speaker, breast cancer survivor Kimberly Jewitt, stepped up to the microphone and announced, "I am completely disgusted to have to follow something like that." Cheers. Avastin, which works by restricting blood flow to tumors, was first approved as a cancer therapy in 2004. It has since been approved to treat certain cancers of the lung, kidney, colon and brain. In 2008, it was given provisional approval to treat breast cancer, on the strength of two studies that showed it increased the length of time that women went without their symptoms getting worse. Approval came on the condition that Genentech continue research, and report the findings. When those results became public last year, the initial excitement was gone. The delay in symptoms was much more modest. In neither study did women live significantly longer. Some cancer specialists, and patients, say that buried in the larger group are a number of "super-responders," women who show dramatic improvement. Pat Howard calls her own response to the drug "nothing short of miraculous." At the July hearing, some panel members said they hoped Genentech would conduct research to see if it can identify the patients most likely to respond. But Dr. Joanne Mortimer, a breast cancer specialist in California who was on the panel and voted to reverse the approval, said the overall ratio of risk to benefits was out of whack. "There was no improvement in survival, and practically 1 percent of the women [taking Avastin in combination with another drug] died. When you weigh the benefits and the toxicity, it was pretty hard to support full approval." When it came time to defend their decision, CDER officials zeroed in on the lack of evicence that patients on Avastin do, on average, live longer. "There is no dispute... that Avastin has not been demonstrated to improve overall survival in patients with metastatic breast cancer in clinical trials," said Dr. Richard Pazdur, director of CDER's cancer drug division. "Five clinical trials of breast cancer have failed to demonstrate an overall survival benefit." Dr. Lee Pai-Scherf, a medical officer in the cancer drug division, criticized the data in one key trial that Avastin's initial breast cancer indication was based on. The trial, known as E2100, found patients taking Avastin in combination with another drug, Paclitaxel, went almost six months longer without their tumors progressing, than women on Paclitaxel alone. Pai-Scherf said poor data collection made the findings less reliable. While some breast cancer groups support the use of Avastin, other advocates are exasperated. Before the hearing, Karuna Jaggar, executive director of Breast Cancer Action, a group based in San Francisco, says CDER made the right decision. "We cannot settle for hope. We need treatments that perform, that actually improve overall survival and which improve the quality of life for women. Avastin has not been demonstrated to do that." While some see the science as cut and dry, others see an unholy connection between the panel's vote, the new health care law and Avastin's imposing price tag, which runs as high as $88,000 for a full year of treatment. As petition drives got under way last July, Sen. David Vitter, R-Louisiana, wrote to the FDA complaining that "the (FDA advisory) committee's concerns appear to have been based on cost-effectiveness." More recently, conservative writers have described the FDA's moves as heavy-handed government interference. In a much-discussed Washington Times piece last week, Milton Wolf called Dr. Richard Pazdur a "one-man death panel." Avastin's cost was mentioned in passing at the September meeting, but it was not a focus of discussion, and according to FDA policy and officials the agency does not take cost into account when deciding drug approvals. Since Avastin is approved for other uses, doctors would still be allowed to prescribe it, whatever the FDA's decision in this case. However, many insurance companies would likely be reluctant to pay nearly $90,000 for a treatment not approved by the FDA. There was a hint of this in January, when Palmetto GBA, a large Medicare provider, said it was taking steps to no longer cover Avastin as a breast cancer treatment. Under pressure, three days later the company reversed course and said it would continue to pay for Avastin, while the Genentech appeal is pending. Howard and some other women taking Avastin feel like their success stories are being ignored. Marcia Gilbert, 57, saw her breast cancer recur in 2004, and learned it had spread to her bones. After several miserable rounds of chemotherapy, she started receiving Avastin in 2008 as part of a clinical trial at Duke University. The side effects were negligible, she says, and her tumors actually started to shrink. "Pulling one of the few options for someone with metastatic breast cancer smells of government control of our health care and, ultimately, our lives," says Gilbert. "I'm concerned this committee is just looking at statistics, and not the individuals. We're all individuals and we respond individually to treatments." Jaggar says she understands why women such as Gilbert are upset, but says "Avastin can have terrible side effects. It can even be fatal, and we can't just look at a single person's experience." In the studies discussed on Tuesday, reported side effects include hemorrhaging and intestinal perforations, as well as frequent reports of high blood pressure. The accelerated approval program was established in 1992 as a way of shortening the wait for patients to receive new, promising treatments. In the world of cancer therapy, four drugs approved under the "accelerated" approvals have been withdrawn by the companies who make them, all since 2005, according to Erica Jefferson, a spokeswoman for CDER. In 2005, MedImmune said the drug Ethyol should no longer be used to prevent kidney damage in patients receiving chemotherapy treatment for non-small-cell lung cancer. In 2010, Pfizer voluntarily withdrew the indication for Celebrex to be used to reduce a certain type of polyps in the colon. Also in 2010, Pfizer withdrew the indication for its drug Mylotarg, as a treatment for some older leukemia patients. In January of this year, AstraZeneca said it would no longer market the drug Iressa, a therapy for some types of non-small-cell lung cancer. An FDA decision in 2005 had already restricted the drug to certain patients. Since January, about 200 patients -- who have shown a good response to Iressa -- continue to have access to it, under a special program. In each case, the drug company accepted evidence that early results were no longer as promising as they had once appeared. Not Genentech, which will make its presentation on Wednesday. To date, Arnold says, no other medicine has been shown to work better against a certain type of breast cancer. She says the panel should leave Avastin available, at least while research continues. "Ultimately, maintaining accelerated approval while we conduct a new trial is allowed by law, supported by science and is in the best interest of the patients who may need this medicine," she wrote in an e-mail. "The company will present its case based on the scientific data." Arnold says Genentech will present new analyses to "help clarify some of mischaracterizations that have been made about Avastin's data." I'm concerned this committee is just looking at statistics, and not the individuals. We're all individuals and we respond individually to treatments. The company faces a tough audience. Of the six voting members, five were on the panel that rejected Avastin last summer; all five voted to remove the breast cancer indication. Tuesday afternoon, several sounded skeptical about the appeal. One, Dr. Wyndham Wilson, suggested that the modest benefits in the studies were likely due to another drug, Taxol, that was used in combination with the Avastin. Whatever the vote, no final decision will be forthcoming this week. CDER will weigh the advisory vote; no expected date was given for a decision, but it's expected to take at least several weeks. At that point, the call will once again belong to Commissioner Hamburg. This is the first time a company has appealed a reversal of an "accelerated" approval in the program's 19 years of existence. According to Karen Riley, an FDA spokeswoman, it is not the first time a company has appealed an FDA decision, but neither she nor John Jenkins -- the director of the FDA's Office of New Drugs -- could immediately recall another example. Patricia Howard said the meeting was emotionally draining; she and several other speakers were moved to tears during the morning session. Afterwards, she still sounded buoyant, on the good news from her doctor. Even "cancer-free," she says she'll stay on Avastin, as a precaution. Since starting the drug in 2007, she's experienced only a mild rise in blood pressure. With a chuckle, she says, "I'm on medication, but then so is half the world." Aside from this week's hearing, her biggest frustration is that she hasn't been able to get her golf handicap down. She says she treats her cancer as a chronic disease but like most breast cancer patients she feels a sense of walking on pins and needles. Once you know you have it, she says, "It's always there in the middle of the night. It creeps in." She's unhappy that Genentech hasn't performed studies that might explain why she, and some other patients, seem to do so well. But most of her anger is directed at the FDA. "If it's working, why force us to try something else?" CNN's Saundra Young contributed to this report.